Xylooligosaccharides (XOS) and arabinoxylooligosaccharides (AXOS) were produced from the insoluble arabinoxylan fraction of pretreated wheat bran by endoxylanases. The glycoside hydrolase (GH) family 10 xylanases GsXyn10A from Geobacillus stearothermophilus and RmXyn10A-CM from Rhodothermus marinus produced the AXOS A3X, A2XX and A2 + 3XX in addition to XOS. RmXyn10A-CM also produced XA2 + 3XX due to its non-conserved aglycone region accommodating additional arabinose substitutions in subsite +2. The GH11 enzymes, Pentopan from Thermomyces lanuginosus and NpXyn11A from Neocallimastix patriciarum had minor structural differences affecting hydrogen bonds in subsites −3 and +3, with similar hydrolysis profiles producing XA3XX as major AXOS and minor amounts of XA2XX but different ratios of X3/X2. 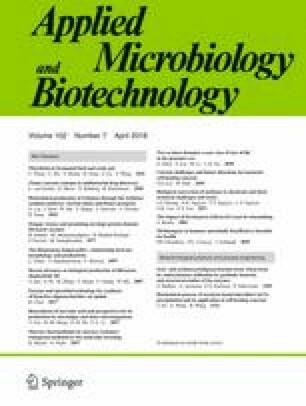 In vitro analysis of the prebiotic properties of (A)XOS produced by Pentopan revealed nearly complete uptake of X2 and X3 by the probiotic bacteria Lactobacillus brevis and Bifidobacterium adolescentis. In contrast to previous reports, the GH43 arabinofuranosidase BaAXHd-3 from B. adolescentis cleaved α-1,3-linked arabinose on some single substituted AXOS. The online version of this article ( https://doi.org/10.1007/s00253-018-8823-x) contains supplementary material, which is available to authorized users. The authors acknowledge the Lund University Antidiabetic Food Centre (a VINNOVA VINN Excellence Centre) for the funding.